"Clipston is as reliable as her character, giving Emily a difficult and intense romance worthy of Emily's ability to shine the light of Christ into the hearts of those she loves." -RT Book Reviews, 4½ stars, TOP PICK! Tragedy tore Christopher's world apart. But Emily believes there are enough pieces left behind to stitch together a beautiful new beginning. Emily Fisher is eager to meet the new employee at her father's shop in Bird-in-Hand, Pennsylvania. But when Christopher Hostettler arrives, his cold demeanor freezes her attempts at building a friendship. Longing for a fresh start, Christopher travels from Ohio to Bird-in-Hand. Christopher's heart is still wounded from memories of home, and making new friends is the last thing on his mind-he knows the pain that comes with losing those you love. When Emily is kind to him, he tries to remain distant, but he soon finds himself stealing glances at her throughout the day. 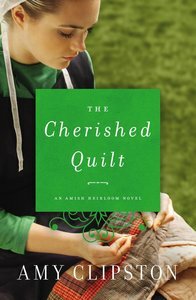 About "The Cherished Quilt (#03 in Amish Heirloom Novel Series)"